Brian's sock was damp, he cried "oh my Lord,"
But you don't really care about that, do ya? Our patience and our bank accounts a-dwindlin'. Summer turned to Fall, NOT A HAMMER LIFT! This has been the longest small-scale project in the history of small-scale projects. When we had the water damage back in March, we had no clue our basement would be torn apart for the better half of a year. 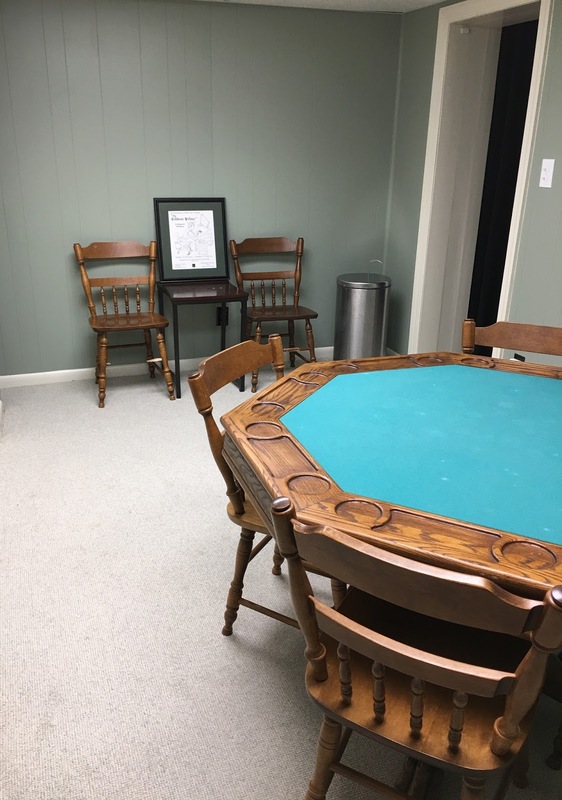 Unfortunately, for now, we had to scratch our original idea of adding another bathroom in the unfinished basement, so there's still a large portion of our basement that remains unfinished. Our year-long basement renovation is almost done and I will be posting the BEFORE and AFTER pictures later this week. Finally!! On November 16th, Cam celebrated his first birthday! After we survived a colicky first two months, Cam has been such a joy. Right now, the challenging part is figuring out a better routine. My work hours and nightmare-ish commute make it really difficult to create a pleasant morning and evening routine. We hosted Thanksgiving at our house again this year with lots family! Brian cooked the turkey and everyone else contributed the side dishes and desserts. Basically, that means I didn't have to do anything! Tonight I will break out my 1,000 piece puzzle!!! Kelly's 3rd Annual Christmas Puzzle tradition! Brian and I had to clean our dining room since we hosted Thanksgiving, so now I have the perfect place to complete my masterpiece. I purchased four bottles of holiday wine for the occasion (to be divvied up over the next few weeks, of course). If you wish to create your own Christmas puzzle tradition, I suggest Amy Grant Holiday Radio on Pandora as the perfect musical complement, along with a pine-scented candle. I've been re-reading my cookbooks lately. Reason #1: I want to be more intentional about meal planning, grocery shopping, and cooking. b) recovering from being a mom while Cam is asleep. The recovery includes alcoholic beverages and lots of sleep. Back in May, Cam started sleeping through the night and he goes to bed early now (6pm). I'm tempted to go to bed early too (6:01pm), but I think after twelve months of recovery it's finally time that I start getting back to my old self. Blogging, cooking, baking, making huge messes, annoying Brian. Reason #2: I have nothing else to read. I read Stephen King's "The Stand" this year. It was good. Laws yes, it was good. Life of Pi has been holding tight to it's #1 spot on Kelly's Favorite Books List since 11th grade, but I think The Stand may have finally taken the lead. I finished it in August and I cannot bring myself to read another book because I know I will be disappointed. Nothing can top The Stand. My life might as well be over. Literary speaking. I decided I would do a special breakfast this morning for Cam since I had the day off work. I like to make things special, especially around the holidays. I made the Pioneer Woman's sour cream pancakes this morning, but I substituted Greek yogurt because I had no sour cream. The sour cream pancake recipe. Greek yogurt because I was sans sour cream. Ignore Cam's skepticism. They really were the best pancakes I have ever had! Given that the basement renovation is taking forever, I've mentally moved on to a new project - a Master Bedroom facelift. The Master Bedroom was never decorated, it's just a hodgepodge of different pieces, which has worked fine. Remember this post? 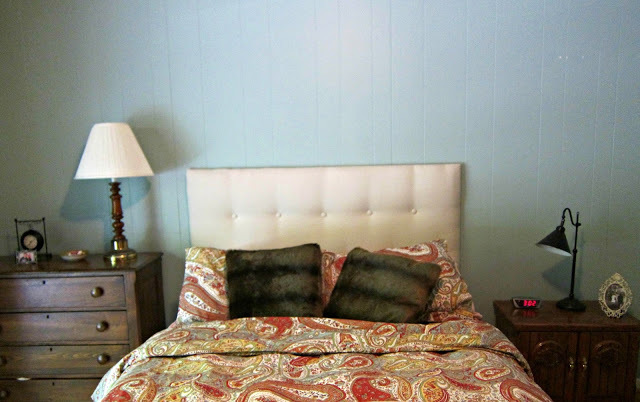 I bought an upholstered headboard at the flea market, but we decided not to make any big furniture purchases since we couldn't find something we really loved at the time. Note to readers: Do not get an upholstered headboard. I know they look great, but I would not make that mistake again. They are impossible to clean. I think ours got dirty from our dogs laying up against it, but even without dogs, I think hair products, oil, and dirt would eventually have the same effect. Since I have zero interior design skills, my plan was to recruit Brian to design the room for me or schedule an in-home consultation with Pottery Barn (they offer free in-home design services). As luck would have it, Brian and I went to North Hills on Saturday and could not find a parking spot anywhere except for a spot marked designated for "ETHAN ALLEN CUSTOMERS ONLY." So I parked there, with no intention of ever being a customer. When we got out of the car, I started walking a different direction, and Brian was like "Aren't we going to Ethan Allen?" Lady at Ethan Allen: "Can I help you find anything?" Me: "No, we just parked in your reserved spot outside so we had to come in here and look around." Me: "This looks like a Pottery Barn. Do you offer free in-home design services like they do at the Barn of Pottery?" So it turns out that they do. And now I have a free in-home design consultation scheduled with Ethan Allen on December 3rd. And by the time this is all said and done, Honest Abe Strawberry might be regretting that trip to North Hills.